The Network and Carrier Ethernet community recently gathered for the MEF16 Excellence Awards, a special presentation at MEF16, to recognize service, technology and applications as well as professional excellence and innovation within the field. 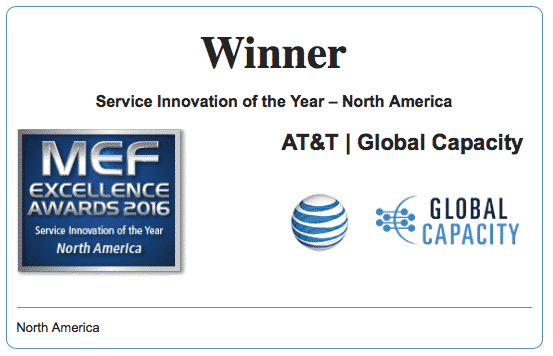 Global Capacity, the leading connectivity as a service company, was presented an MEF16 Excellence Award in the “Best Service Innovation – North America” category for its Ethernet Cloud Connect service. The Ethernet Cloud Connect service streamlines commercial buying across the Cloud services ecosystem by combining the reliability and flexibility of multi-destination Ethernet Virtual Private Line (EVPL) and Global Capacity’s One Marketplace™ direct interconnects to internet, Cloud computing and Cloud application providers. This service also combines established interconnects with software orchestration to simplify multi-Cloud connectivity and improve service performance. The service was created to deliver a better user application experience for customers. Customers can use Ethernet Cloud Connect to connect to private Cloud locations, or select from a list of existing One Marketplace Cloud destinations. Additional Cloud and Application Service Provider interconnects are still being planned for 2016. MEF Chief Operating Officer Kevin Vachon also offered praise for Global Capacity. In case you’re unfamiliar with Global Capacity, the company eliminates the complexity and inefficiency of the network market with One Marketplace – the award winning marketplace of networks. One Marketplace delivers unprecedented transparency, simplicity and efficiency to the highly-fragmented data connectivity market. It does so by combining network delivery and service automation with a suite of customer and supplier applications, to streamline the process of designing, buying, pricing, delivering and managing data connectivity solutions. Global Capacity’s One Marketplace dramatically simplifies and fundamentally changes the way that businesses are able to buy connectivity. For this reason, it’s the provider of choice for hybrid WAN and Cloud Connectivity solutions. For more information about Global Capacity, click here.